Nuts may also be an expression of contempt but these little wonders of nature are a treasure trove of health. Nuts are also a mainstay during navratra. Eaten as snacks and added to sweet and savory dishes, even used as prasaad, make them an important part of your fasting regimen. Each one of them gives our body nutrients that not only add to our health but also protect us. Nuts are seeds of plants with mostly a hard outer covering that needs to be removed. Nuts are literally parents of new plants which is why they are loaded with essential nutrients. Nuts are sources of proteins, fiber, vitamins, minerals, phytosterols and phenolic compounds. 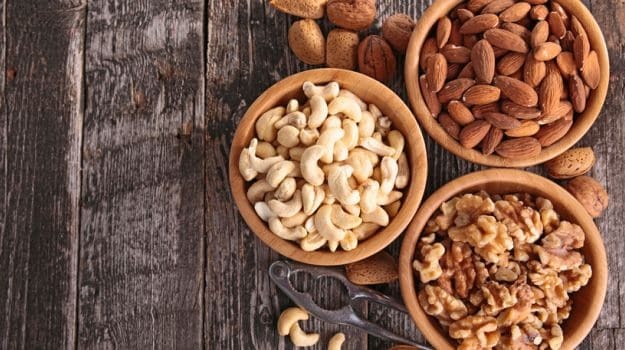 A number of scientific studies have found that regular nut consumption is linked to lower risks of heart diseases, lower cholesterol, prevention of gall stones and diabetes in women. Nuts are also sources of antioxidants and anti-inflammatory compounds. Most nuts contain Vitamin E, B2, folate and essential minerals like magnesium, potassium, phosphorus, copper and selenium. 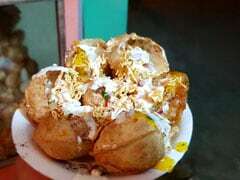 They are fat dense, but have a very healthy lipid profile which is protective to our heart and health. Most fats in nuts are healthy monounsaturated fat and omega-3 fats. These tiny wonders are low in glycaemic index too. Almond plant is native to Middle East, Indian subcontinent and North Africa. Most commonly eaten varieties are Mamra, Gurbari and now Californian. They are the seeds of almond fruits. These drop shaped wonders of nature are a powerhouse of nutrition. One ounce, about 23 whole kernels, provides 164 kcal, 6gm proteins, 14gm fat of which 8.9gm are heart healthy monounsaturated fats and 0 cholesterol. In addition, they provide 3.5gm of fiber, 1mg of iron, 136mg of Phosphorus, 12ug of folate and 7mg of Vitamin E. Almonds are also a good source of B vitamin riboflavin. Quiet a mouthful? Well to put it simply - it's one healthy nutty delight! 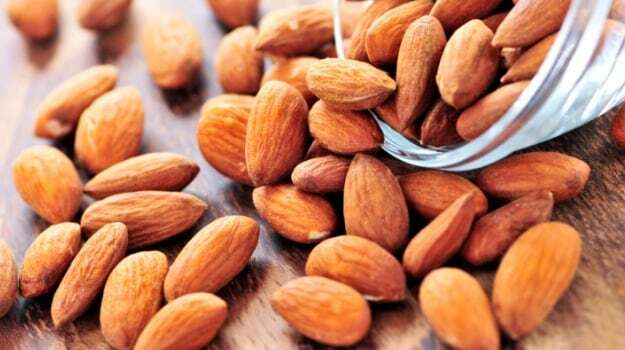 Almonds are linked to lowering LDL cholesterol in innumerable studies. Rich in monounsaturated fats, fibre, phytosterols, plant protein, tocopherol, arginine, magnesium, copper, manganese, calcium, and potassium makes them heart protective. These single seeded fruits of the walnut tree are dense with nutrients like proteins and essential fatty acids. The outer hard shell encloses two halves of the kernel, which is the edible portion. The kernels are wrapped in a brown skin, rich in antioxidants protecting the nut from rancidity. 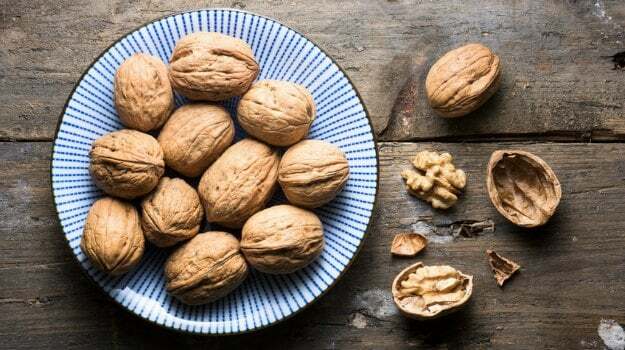 One ounce of walnuts - about 7 shells or 14 halves, provide I85 Kcals, 4gm protein, 18.49gm fat, and 1.9gm of fiber. In addition, walnuts are sources of B vitamins, folate and minerals. Walnuts are rich in poly unsaturated fats too. The omega -3 content of these nuts is one of the main reasons for their cholesterol lowering effect in the body. Walnut kernels have twice as much antioxidant content as other nuts. These seeds grow outside the apple fruit of the cashew plant, an evergreen tree. Originally from Brazil they are cultivated in India today. The pulp of its fruit is distilled into a popular liquor in Goa, Feni. One ounce of cashews provide 157 Kcal, 5.17gm proteins, 12gm fat, 168mg phosphorus, 1.89gm iron, vitamins K and E, and minerals. Cashews have the lowest fat content among the nuts, 88% of their fats are polyunsaturated fats and 66% of these are heart healthy monounsaturated fats. Like other nuts, these are rich in antioxidants making them immensely beneficial to your health. Magnesium present in cashews are vital for bone health. This nut is actually a legume, and an oil crop. The peanut plant improves soil fertility by improving its nitrogen content. Nutritionally, one ounce of peanuts provide 161 Kcal, 7.31gm protein, 14gm fat, 2.4 gm fiber, 107gm phosphorus, 68ug Folate, and 24gm monounsaturated fat. These are a rich source of minerals like copper and manganese, Vitamins E and B. They also contain an antioxidant resveratrol in the skin, which is known for its heart protective activity. 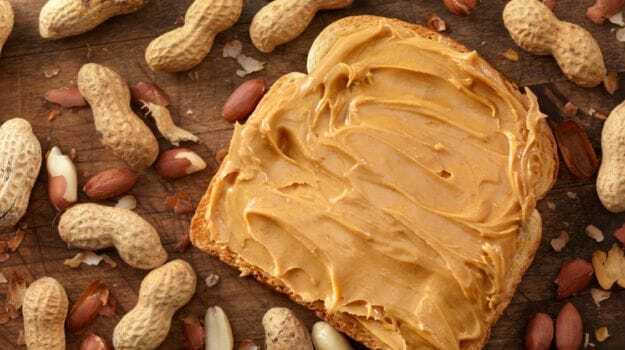 In the Iowa Women's Health Study, risk of death from cardiovascular and coronary heart diseases showed strong and consistent reductions with increasing nut/peanut butter consumption. Total death rate decreased by 11% and 19% for nut/peanut butter intake once per week and 1-4 times per week, respectively. Nuts are amazing for our health. But too much of a good thing may not be so good... so stick to a handful a day and reap the benefits of good health.